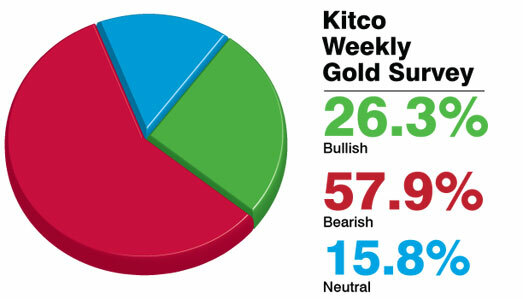 (Kitco News) - Most participants in Kitco News’ weekly gold survey said they look for softer prices next week since a Swiss gold referendum is expected to fail and the dollar has been strong while crude oil has been soft. In the Kitco News Gold Survey, out of 36 participants, 19 responded this week -- fewer than usual during the U.S. Thanksgiving week. Five see prices up, while 11 see prices down and three see prices sideways or unchanged. Market participants include bullion dealers, investment banks, futures traders and technical-chart analysts. Last week, survey participants looked for prices to rise this week. Shortly before noon EST, Comex gold for February delivery was down $18.60 for the week. Prices were roughly flat as of Wednesday prior to the break for the U.S. Thanksgiving weekend. Choosing gold’s direction next week might be even trickier than usual since one of the major events that could dictate price action – the referendum in Switzerland on central-bank gold holdings – occurs Sunday before traders even get to their desks next week. Polls suggest the measure, which would mean increased Swiss National Bank gold purchases if it passes, will fail. As a result, traders have said a “no” vote is slightly bearish to neutral since this outcome is expected, although a “yes” vote would boost prices. Colin Cieszynski, senior market strategist at CMC Markets, looks for gold to ease next week.